(The Little Black Songbook). This pocket-sized collection features 80 of Sir Elton's timeless hits from 1969 right up to 2011. Presented in chord songbook format, each song includes chord symbols, guitar chord diagrams, and complete lyrics. Songs include: Bennie and the Jets * Candle in the Wind * Crocodile Rock * Goodbye Yellow Brick Road * Honky Cat * Levon * Mona Lisas and Mad Hatters * Sad Songs (Say So Much) * Tiny Dancer * Written in the Stars * Your Song * and many more. 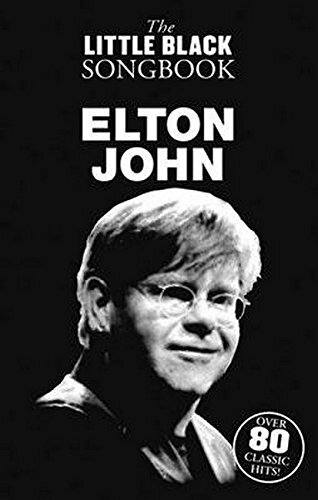 A pocket-sized collection of Elton John songs presented in chord songbook format, with guitar chords boxes, complete lyrics and a tuning/playing guide. Songs from 1969 right up to 2011.